With a series as long running as Lois McMaster Bujold's Vorkosigan saga, there are always questions as to which book is the best one to serve as a series introduction. Do you start with the first published book? That way, you don't have any of the baggage of having to deal with things you should have known reading a particular book or dealing with chronology issues. Do you start with the first book in the series internal chronology? In this case, it is the preferred reading order of the author, but one drawback of this is that when the books are not written in chronological order, reading them that way can diffuse some of the power and surprise of events in earlier written books set later in the chronology (consider Star Wars). Or, do you just pick up whichever book you happen to run across and hope that it isn't one that absolutely requires knowledge of other books to fully appreciate it? 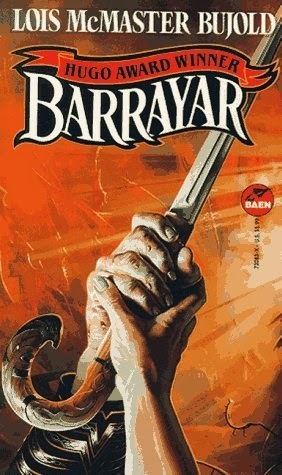 Depending on one's perspective, Barrayar is either the seventh novel in publication order, the second of the primary series dealing with the Vorkosigan characters, the third novel if you count Falling Free (set 200 years prior to anything), and it is definitely the second novel dealing with the character of Cordelia Naismith, set shortly after the events of Shards of Honor. While I'm not sure if this is the ideal place to begin reading Lois McMaster Bujold, it is what I have to work with. The background of Barrayar has the aftermath of a war where one of the captains from the winning side, Cordelia Naismith ends up meeting and falling in love with a general from the losing side, Aral Vorkosigan. She sacrifices much of her life and culture to live with Aral on his native planet, Barrayar. As the novel opens, she is pregnant with his child. I expect that had I read Shards of Honor, my understanding of what led up to this point would be drastically different that from picking up the clues in the text of Barrayar. What I do know is that some exceptionally nasty things occurred in the war (as happens in war). As in Shards of Honor, the protagonist here is Cordelia and despite the rather weak sounding background description I gave, Cordelia Naismith is a remarkably strong and well written character of depth and determination. Accepting of a somewhat backwater patriarchy with less technological advancement than where she came from, Cordelia is not. She toes the line only so far as necessity forces her to. The rest of the time, she pushes back. She is an absolutely wonderful character with agency and one whom you will likely be sad that there are only two novels which feature her as the protagonist. From this one book, I'd like a whole lot more of Cordelia. Here's what you can find in Barrayar: war, insurgency, genetics, politics, action, adventure, family drama, gender politics. Here's what you need to know about Barrayar: All of it is exciting, fantastic, and intelligently written. A better writer than me would have all sorts of smart things to say about Barrayar, but what I have is an unhesitating recommendation: read this book. It doesn't matter if this is the first Bujold that you've read or if you've read everything else but this one. Barrayar is a smart, exciting, tension-laden novel and is one well deserving of being read and read again. Damn, this was a good book. This is one of my all-time favorite series! I wouldn't call Barrayar the optimum starting place for the books. I began with Warrior's Apprentice, then Shards of Honor (probably reasonably close to their release dates), and have eagerly awaited every book she has written since then. Have you read any of her Chalion fantasies? I'd agree that it isn't necessarily the optimum place to start, but for some reason it's the one Bujold novel I've owned (for years). This was my first Bujold, but it won't be the last.